Littleton Public School’s Director of Information Technology, Mike Porter, has received the 2018 Colorado Association of Leaders in Educational Technology (CALET) Dan Maas Technology Leadership Award from the Colorado Association of School Executives (CASE) for his outstanding professional contributions to educational technology. In his role at LPS, Porter is responsible for data systems and student and staff technology throughout the district. This includes managing more than 20,000 computers, devices and A/V components - the tools that deliver technology into the classroom. Porter applies this technology across the district with help from LPS Instructional Technology Specialists Christy Swafford and Dana Levesque. The award was previously known as the CALET Outstanding Technology Administration Award, and was renamed in 2017 in remembrance of Dan Maas, former LPS Chief Information Officer and a former CALET and CASE President. “Winning the award is significant to me for many reasons, and being recognized among colleagues is certainly an honor. However, Dan Maas was a friend, mentor and supervisor for many years. 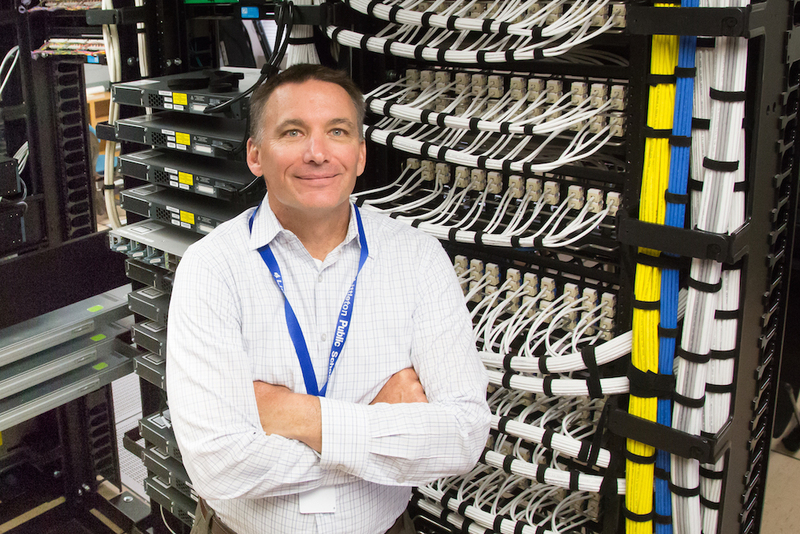 He hired me for LPS 12 years ago and helped me get into Instructional Technology,” said Porter. LPS has won the CALET award four times (Lowell Ensley, Dan Maas, Mark Lindstone and Porter); more than any other school district in Colorado.